My Book VelociRaptor Duo Dual-drive Storage System ? Extreme speed and capacity for your creative projects. My Book VelociRaptor Duo, dual-drive storage system unites two 10,000 RPM WD VelociRaptor drives with revolutionary Thunderbolt technology for extreme speed. The daisy chain capability of Thunderbolt technology lets you add more drives for even more speed and higher capacity; then add peripherals and enhance your productivity. Extreme speed of WD VelociRaptor drives inside. With the extreme speed of two 10,000 RPM WD VelociRaptor drives inside united with the revolutionary speed of Thunderbolt technology your creative inspirations have never moved so fast. 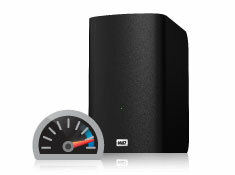 The dual Thunderbolt ports make it easy to daisy chain more drives for even greater speeds and higher capacity. Add peripherals to further enhance your productivity. User-configurable for speed or double-safe data protection. 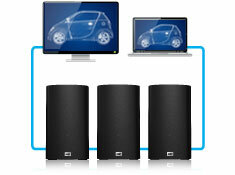 Customize this dual-drive storage system to your needs ? 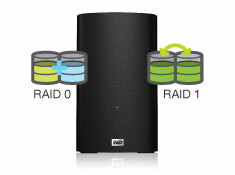 RAID 0 for speed, RAID 1 for data protection, JBOD to use the drives individually. Extreme speed, high capacity storage - Built with two 10,000 RPM WD VelociRaptor drives inside, My Book VelociRaptor Duo delivers extreme speed and high capacity for high-end video and photo editing, 3D rendering, graphic-intensive design and more. Move data at unprecedented speeds - The revolutionary Thunderbolt connector provides two channels of up to 10Gb/s transfer rate in both directions. This allows data to travel both ways without compromising bandwidth. This means video files are imported faster, visual effects are rendered in record time and you can power through your projects. User-configurable RAID for speed or double-safe data protection - You can select the RAID mode that's right for you. Choose RAID 0 (striping) for the performance you need when designing or editing graphic-intensive media files. When the drive is set to RAID 1 (mirroring) it provides double-safe data protection by automatically generating a duplicate copy of your data. Set the drive to JBOD (Just a Bunch Of Disks) to use as two individual drives and select between HFS+J or ExFAT per disk. Ideal for running Windows OS on a Mac. Daisy chain more drives for more speed - The dual Thunderbolt ports allow you to daisy chain more drives for more speed and higher capacity. Connect a Thunderbolt display and other Thunderbolt-enabled peripherals to achieve maximum efficiency and productivity. High-speed multi-tasking - The revolutionary bi-directional Thunderbolt technology delivers unmatched speed for multi-tasking while video editing, 3D rendering and completing other graphics-intensive projects. User-serviceable - Want to replace a drive? Simply open the case and exchange the existing drive. If you fill up a drive, you can simply remove it and replace it with a fresh drive and begin saving even more of your creative life. Lightning-fast boot drive - My Book VelociRaptor Duo can be used as a lightning-fast system boot drive. So while others are still starting up their system, you are already working on your creative masterpiece. 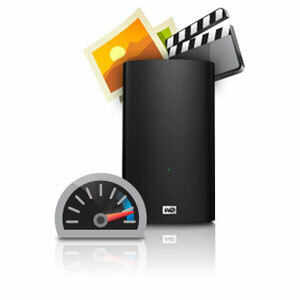 WD Drive Utilities - Register your drive, run diagnostics, manage RAID or JBOD modes and more using WD Drive Utilities. Dual-drive storage system with Thunderbolt ports, Thunderbolt cable, AC adapter, Quick Install Guide.